When Eric breaks the camp lighter and the fire goes out, the castaways are in real trouble. That fire is their source of heat, smoke signals, and, most importantly, clean water. No one is having much luck getting the fire going, but when Jackson gets very sick from drinking unsanitized water, the heat is really on. Can they get the fire lit again before it’s too late for one of their own? While the dangerous atmosphere from the TV show is kept in this book, there is a lot more added that is not. Also, some characters are portrayed differently from the books (e.g. Jackson is a bit meaner). 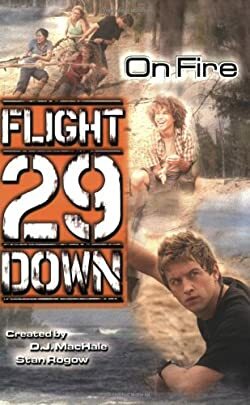 The series should be started with Flight 29 Down before picking up these latest books.